Nick Jones from The Exeter looks at simplification and whether this is enough to engage with customers. It’s often said that the hardest challenge of all for any product or service provider is to be simple. However, that hasn’t stopped a huge number of brands driving a sea change on this front in recent years. In 2016 the phrase ‘simplify or die’ is commonly used and accepted. The reasons behind the drive for simplification are numerous but perhaps the biggest single driving force behind our ever-increasing desire for simplicity is time, or rather a lack of it. As consumers, we all seem to be increasingly time poor as the years roll on. The days of 9 to 5 jobs seem to be long gone and quiet nights in are becoming few and far between. That leaves things like insurance and financial planning fighting for space in people’s busy lives. Consumers only have so much time to consider such mundane things as protection insurance so simplicity is no longer a choice, it’s become a hygiene factor and not just in protection but in almost any product or service we buy. There’s no doubt that as an industry we have been guilty of over complicating things in the past, with perhaps income protection the prime offender. This is a product that has consistently been recognised as the most important aspect of most financial portfolios, but a product that has failed to capture the attention of consumers and, as a result, advisers. However, this situation has changed in recent years and income protection providers across the market have made a number of improvements to their plans to simplify the sales and buying process, making them fitter for the world today. Take income protection and its interaction with state benefits for example. In the past the way products were designed meant that claimants often had any state benefits they received deducted from their income protection claim, which by many was seen as not only unfair, but another complexity to an often lengthy claims process. Thankfully, this situation is changing rapidly. Many policies now offer a cleaner and simpler interaction with the state, ensuring that claimants don’t lose out simply because they take the benefit from their hard earned tax pounds. Another major frustration of income protection has been financial underwriting - especially at claim. This approach caused complexity and confusion, especially for the self-employed and policyholders with a fluctuating income. It could leave some more than confused and indeed sometimes, out of pocket if their income was deemed not high enough at claim. After all – how many of us could remember the level of benefit we selected on a travel insurance policy last week, let alone an income protection policy 10 years ago? Again progress has been made. Insurers have developed different solutions to simplify the claims process and remove some, if not all of the burden of financial underwriting at claims stage. Whilst the nature of income protection means it is important for insurers to protect against claimants being over insured, again simplification here has taken many propositions a step forward, both in the minds of advisers and hopefully their clients. As recently as a few years ago, it was commonplace to read the terms and conditions of an income protection plan and find that cover didn’t extend to injury caused by acts of terrorism or as a result of self-harm, amongst many other seemingly strange historic exclusions. The impact of these relatively minor exclusions wasn’t just a narrowing of cover, it was the perception of income protection overall that took a hit. Not only do unnecessary exclusions take time and effort to describe and convey in policy terms, they can cause a loss of trust. For an industry that already has an issue here, this is a self-inflicted wound. Thankfully, in the main these exclusions are now a thing of the past, with most plans being modernised to meet the times and truly reflect the limited risk these exclusions posed. Who knows, in a few years we could conceivably be receiving orders from Amazon the same day via a drone, which makes the concept of having to wait days and weeks to buy an insurance contract almost absurd. The great news is that the flaws of the application and underwriting process of the past have to a great extent been improved. Speaking from experience at The Exeter we are now able to offer an immediate decision to almost 70% of income protection applicants. But that doesn’t mean we can rest on our laurels. The best and slickest buying processes across the web are that way for a reason, they reduce the time and effort taken to buy goods and services. Again, thinking about Amazon, it takes seconds and zero thought to buy all manner of products and whilst the nature of what we do means it is impossible to achieve this, it doesn’t mean we shouldn’t strive to get as close as possible. The question is simple - is simplicity enough? 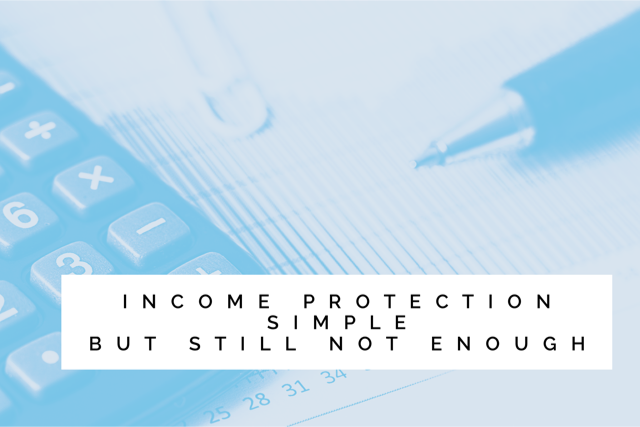 So, there are a number of improvements that makes income protection a much more attractive proposition today and one which is in the process of shedding its complex image. Despite this, growth remains slow, which begs the question - what more needs to be done to help this product reach its true potential? There are a number of other factors at play which may be holding the product back, many that have been spoken of and written about at great length over many years. I just want to touch upon a single factor, one which in my mind is the single biggest reason why we fail to engage the public and ultimately create a wider need for income protection. How effective any brand or market is depends heavily on how it communicates with stakeholders of all kinds. You can have the greatest product or the simplest service but if you can’t communicate or can’t engage you’re unlikely to succeed. This, I think, it is our single biggest failing – we just can’t communicate the benefits of protection in a positive, confident way. Think about it (and I know I am guilty of this too), how often have we tried to sell the concept of income protection by describing product features or simply by quoting “affordable” premiums? Will this approach ever convince the doubters? Look across the advertising and communication landscape today and you will see a very different approach. The tech industry is usually at the cutting edge of these approaches, often years ahead of the financial services sector. If you look at how the latest tablet or smartphone is now pitched to us as consumers, rarely are product details stated or confirmed, they simply show you how this product, this piece of plastic and glass will make your life better. It may or may not deliver in reality, but that’s the belief. So, how do we achieve that with protection? The closest we have got so far is with 7 Families, stories that depict how fragile health is and the life-changing effect ill health can have on finances. But this must be the beginning, not the end. As insurers we must be able to continue this legacy.